I was in heaven when Benson and Jayne came to me for help planning their wedding. 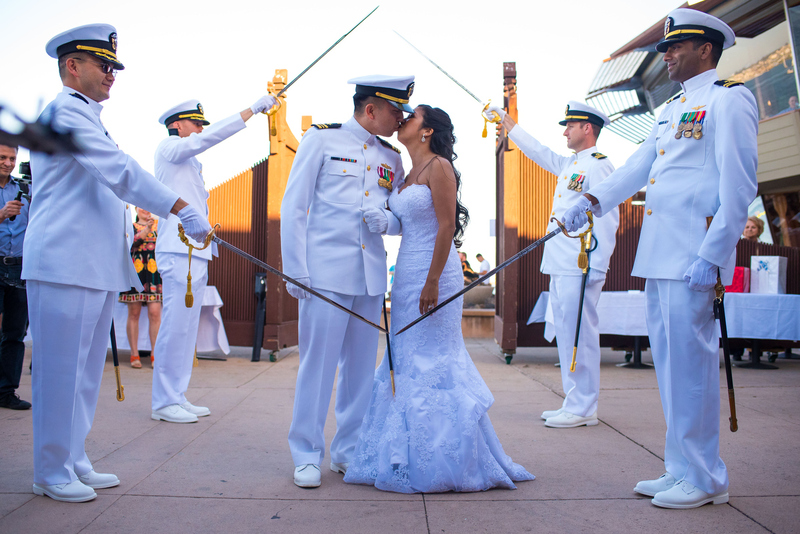 Both the bride and groom were in the military (Navy and Air Force) – my favorite groom’s attire is a uniform. 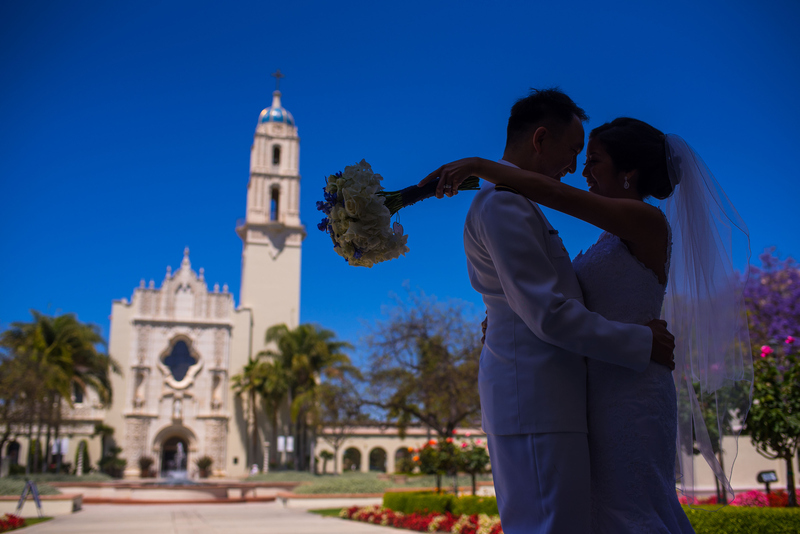 They wanted a Catholic wedding at the Immaculata at University of San Diego – I am a USD alumna. 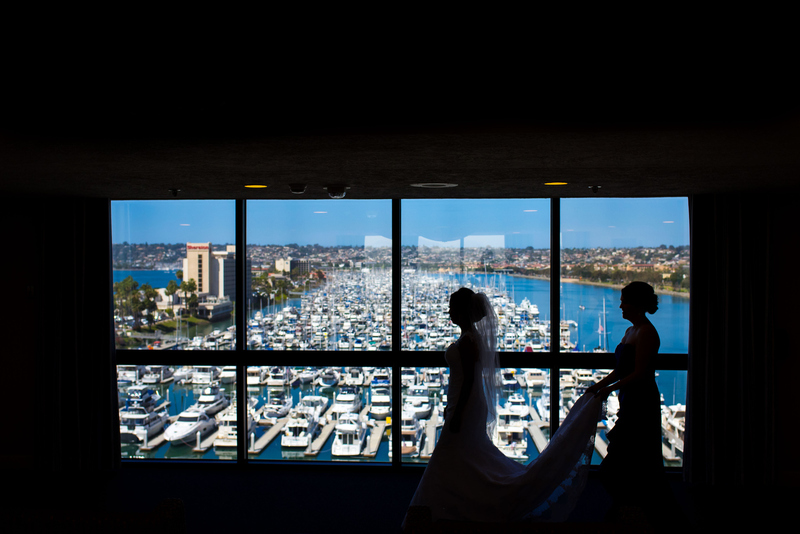 And their reception was to be at the Bali Hai – which hosts my favorite San Diego skyline view! 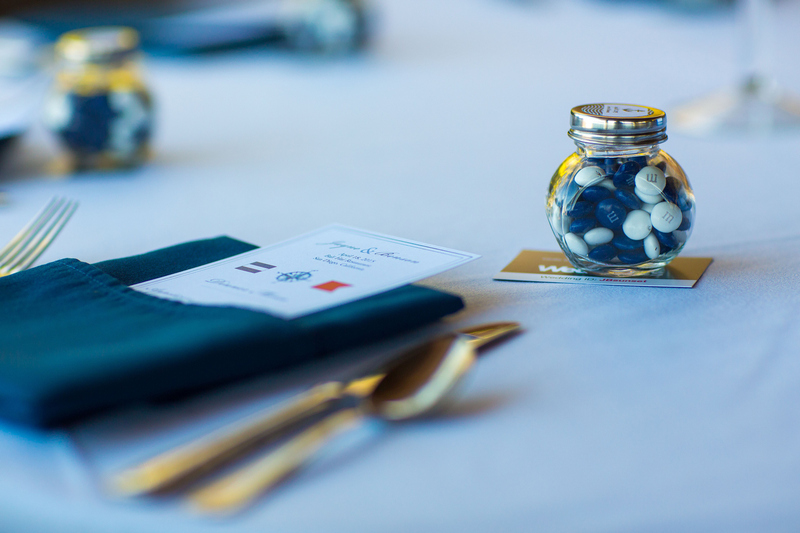 The colors for the nautical themed wedding were blue and white. The bridal bouquet by FloralWorks and Events was simple and elegant with just the right amount of blue. The amazing Brett Butterstein Photography captured the day. This is one of my favorites of the bride leaving the hotel ready meet her groom! 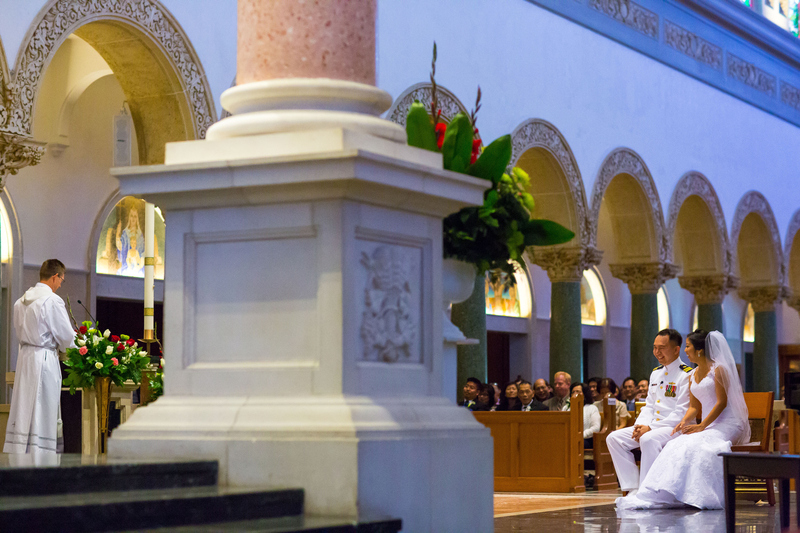 The Catholic ceremony was held at the Immaculata Parish at the University of San Diego. If you follow my blog, you know it is one of my favorite places on the planet, so I’ve included lots of photos for you. 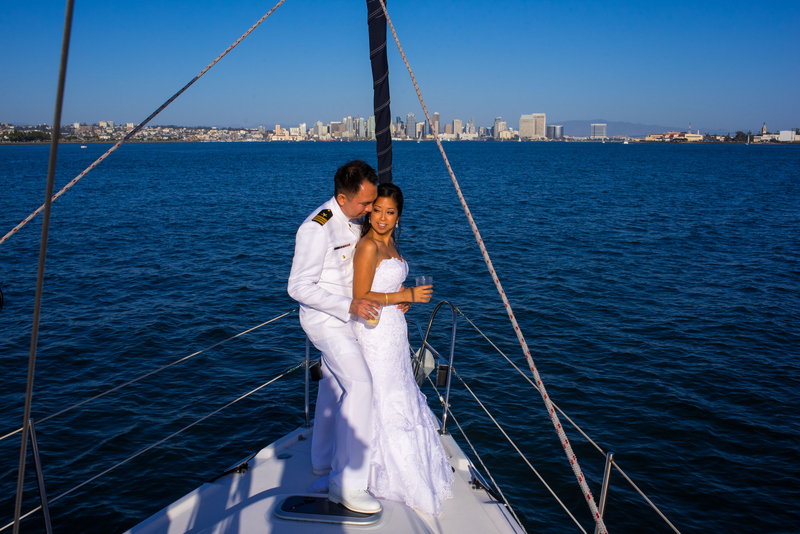 After the ceremony, the couple headed to Harbor Island to board a sailboat to grab some alone time as husband and wife, and to make their grand entrance into the waterfront reception. They were greeted at the reception with a traditional military sword detail forming an arch for the couple to walk through. 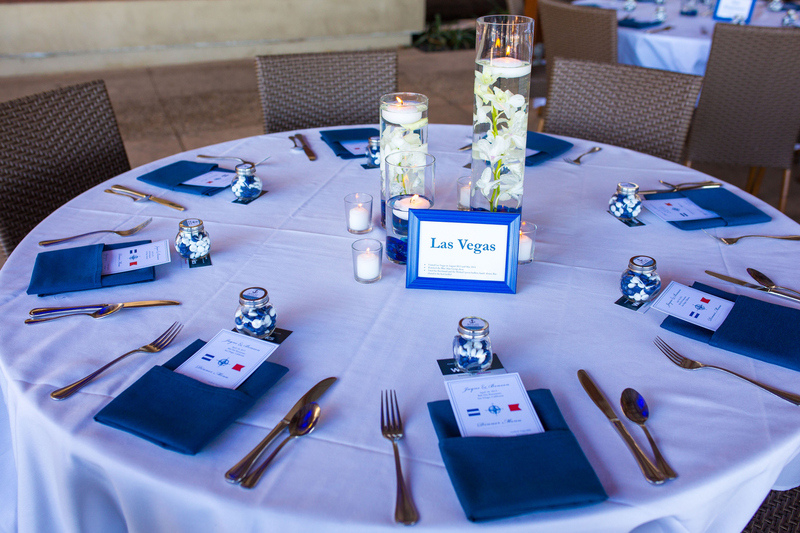 The reception tables were decorated in blue and white with nautical details. The tables were named after places the couple had visited. 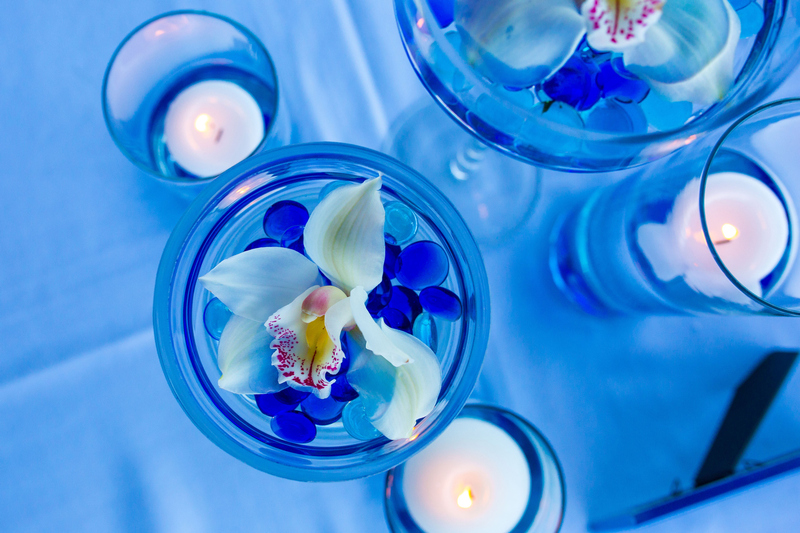 Two different centerpieces were alternated between the tables featuring floating candles and submerged orchids. 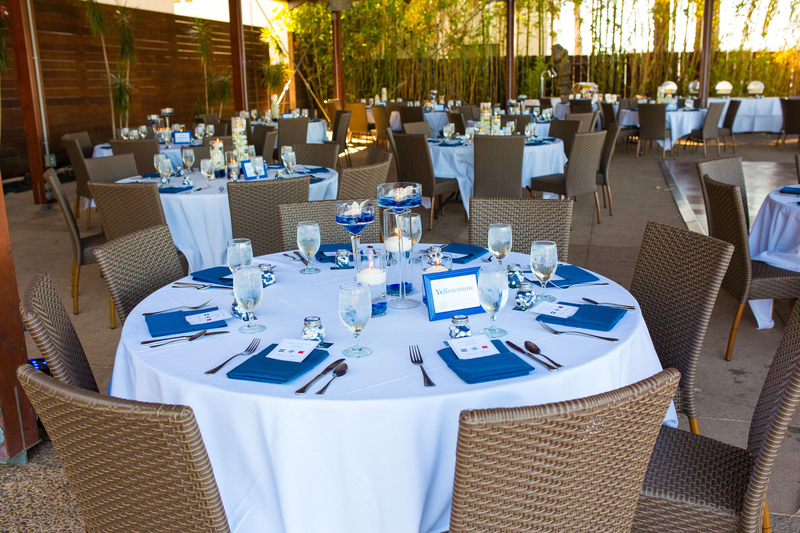 The adorable menus with sailing flags were created by Take Note! Creations. As the sun fell, blue uplights added a cool glow to the venue. 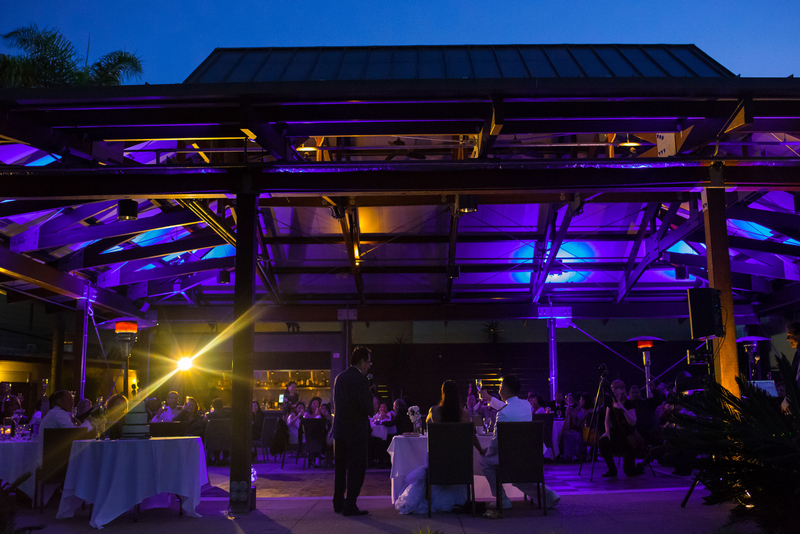 The guests danced well into the night and enjoyed the gorgeous San Diego skyline. 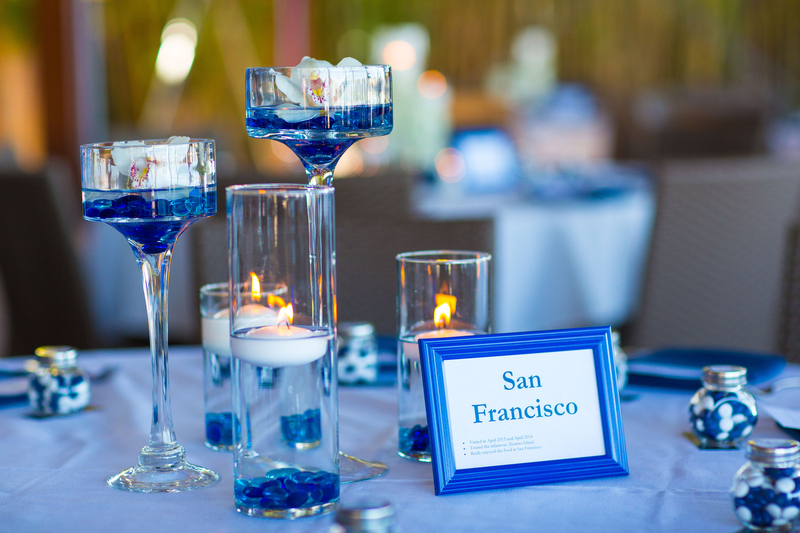 Stephanie Rose Events is one of San Diego’s most respected wedding planning teams. 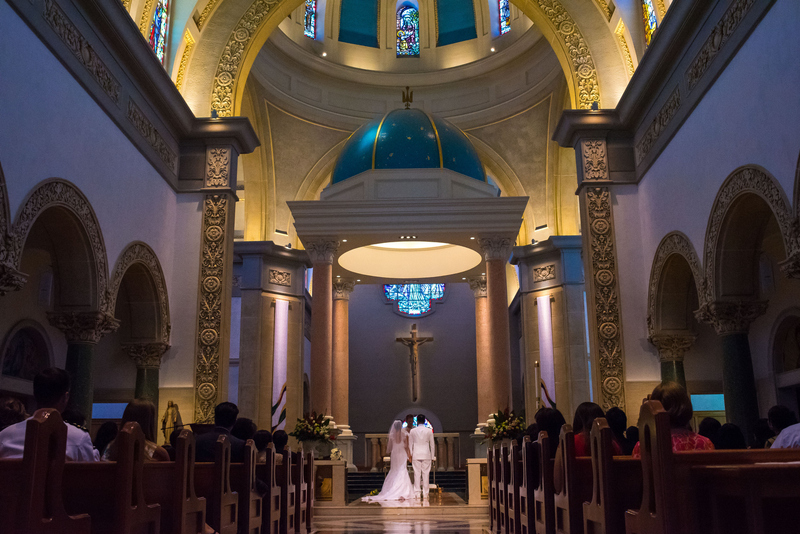 With experience planning Catholic and military weddings in San Diego’s best wedding venues, including Coronado, La Costa and Del Mar, your wedding will be exactly as you envision with every detail executed perfectly. We work with exclusive vendors to create a guest experience that is unique to you. Do you want to stress over the details, or be a Stephanie Rose Events bride and be a guest at your own wedding? Schedule your free wedding planning consultation here. We can’t wait to meet you! When Chio told me her wedding colors were Tiffany blue and silver, I knew we would get along. As you know, my silver desk is surrounded by Tiffany blue walls in my office. 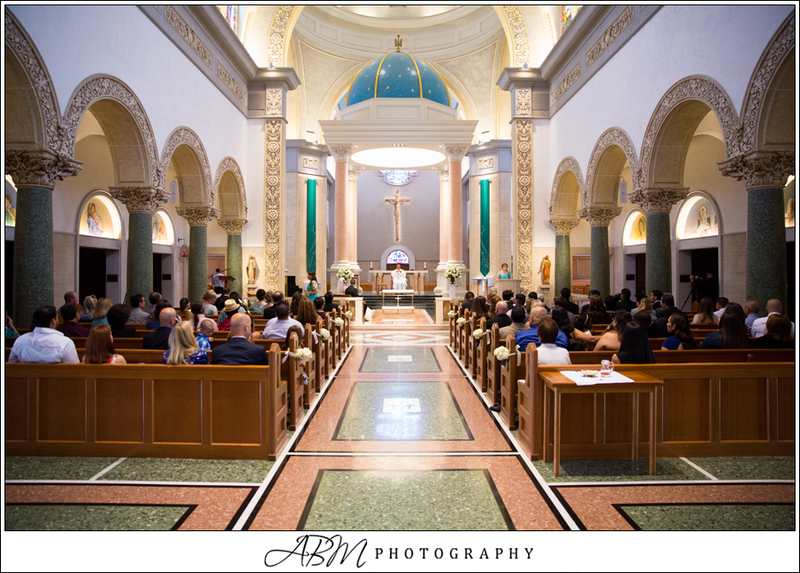 And when the couple selected the Immaculata parish on the USD campus for their ceremony, I was in love with them! 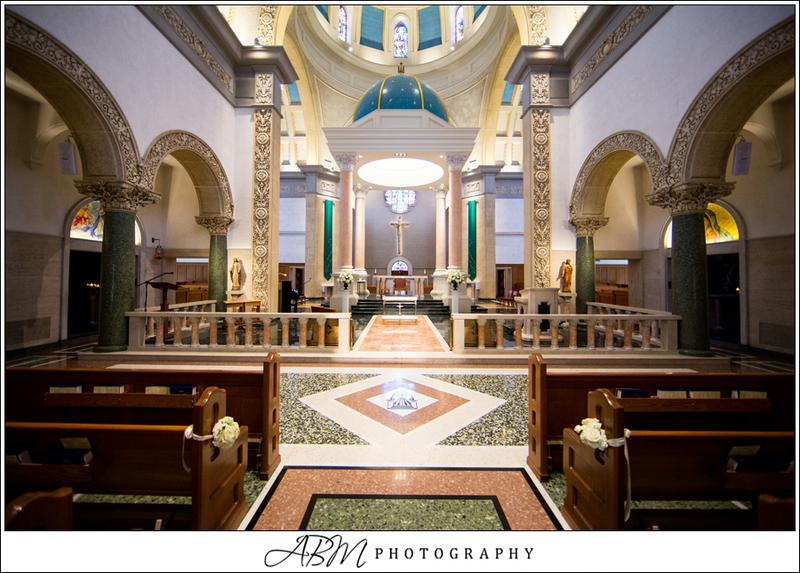 The parish is so beautiful and grand that it doesn’t require much decor. 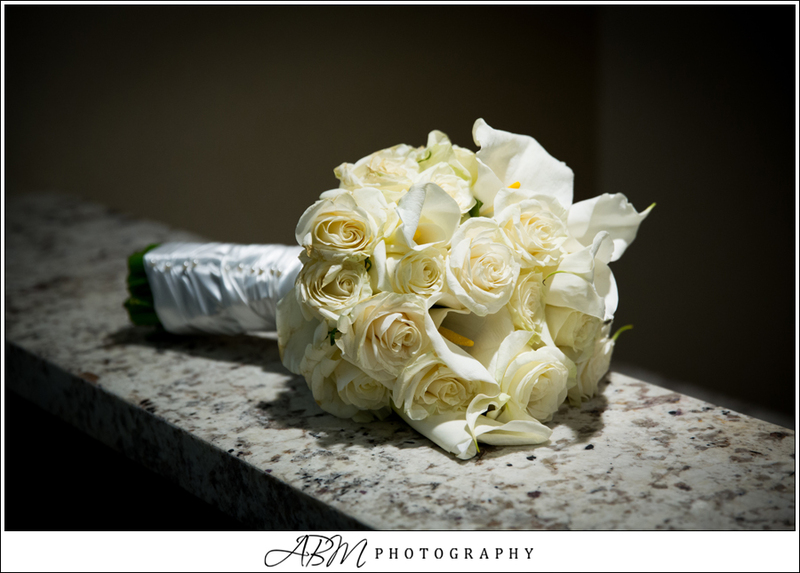 The couple selected two all white floral arrangements to display on pedestals on either side of the altar. 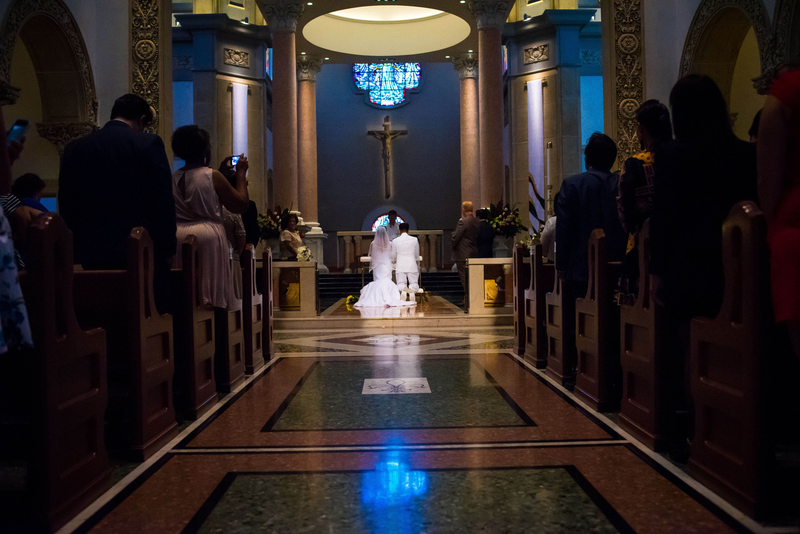 The church pews were decorated with small white floral bouquets to line the main aisle.This parish truly is one of the most beautiful venues in our city. 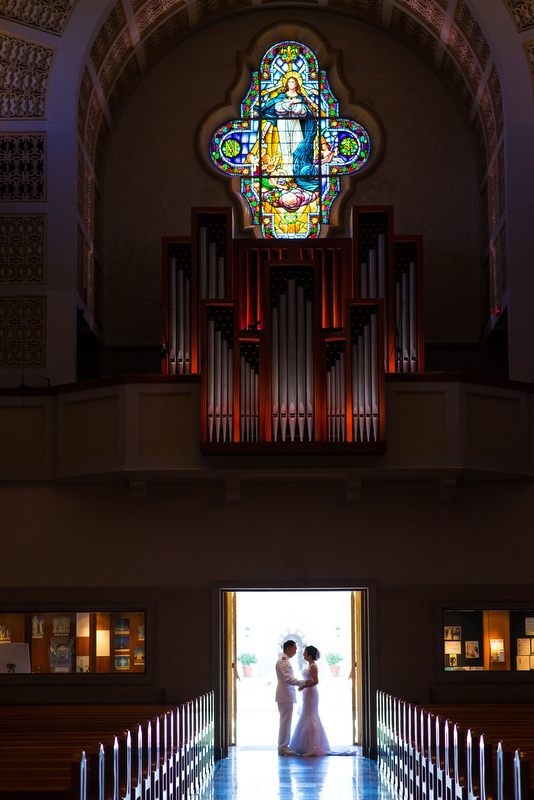 After the traditional Catholic ceremony, the couple and their guests traveled downtown for their reception at the Westin San Diego. At the Westin, guests were greeted with a “Something Blue” cocktail and silver wedding bell place cards, to keep with the color theme. 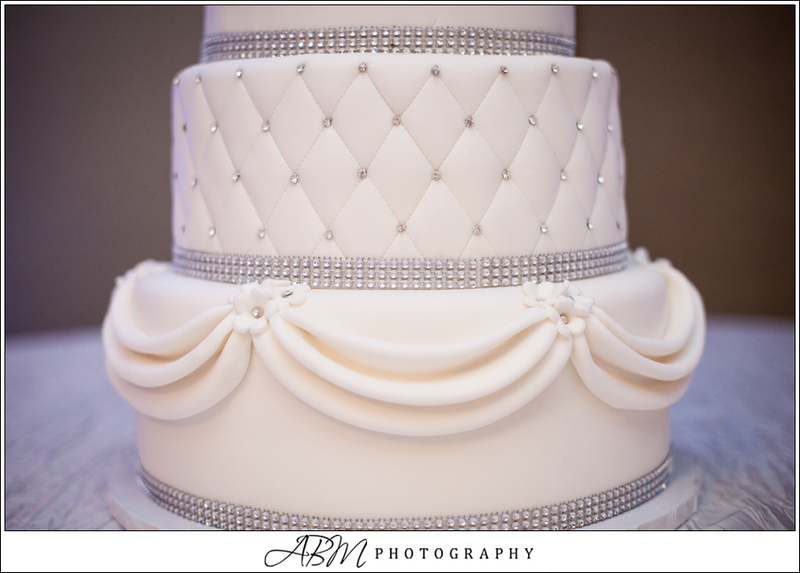 The ballroom sparkled with silver chiavari chairs, crushed taffeta linens in snow and silver rimmed charger plates. Pale blue uplights added pops of color along with the Tiffany blue napkins. The couple selected two centerpieces for the tables. My favorites were these tall lily and orchid arrangements. The sweetheart table wore a lavish silver sequin linen and a small bowl of white roses. 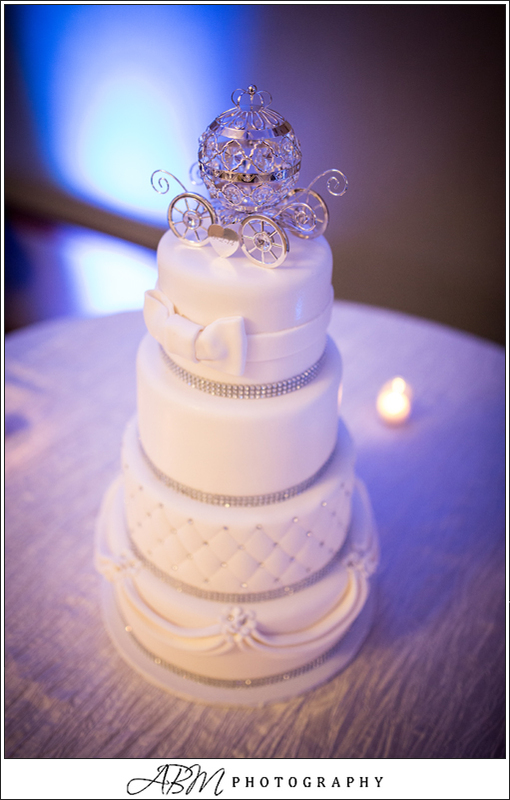 The all white wedding cake was adorned with silver sparkles and rhinestones and was topped by a silver carriage.